It used to be that if you were a qualified performing artist or another professional, and if you paid for job-related expenses out of your own pocket, you could claim those expenses as a tax deduction—and not just any tax deduction, either. This was an above-the-line deduction on the Form 1040 tax return, so you didn't have to itemize to claim it and it reduced your adjusted gross income (AGI), a factor upon which many other tax perks are based. Job-related expenses were normally a miscellaneous itemized tax deduction, subject to the 2% floor, but these types of expenses received special treatment. You could only claim a deduction for the portion of your miscellaneous itemized deductions that exceeded 2% of your AGI. Claiming the qualified performing artist deduction as an above-the-line adjustment to income provided a bigger tax break. Unfortunately, tax reform eliminated the qualified performing artist tax deduction when the Tax Cuts and Jobs Act (TCJA) went into effect in 2018. And no, it's not even a distinction between this above-the-line deduction and the miscellaneous itemized deduction, because the latter has been repealed from the tax code as well. If you're not an employee, however, you haven't lost anything. Self-employed professionals can still claim these expenses on Schedule C of the 2018 Form 1040. If there's any good news here for performers, it's that the TCJA is set to expire at the end of 2025 unless Congress acts to renews it. The status of this deduction might revert back to what it was in 2017 at that time. You'd qualify as a performing artist if you provided services in the arts for two or more employers, receiving at least $200 or more in wages from those jobs, your job-related expenses were more than 10% of your income earned from performing artist jobs, and your AGI was $16,000 or less—without regard to this deduction—in 2017. You could not claim this deduction if you were married but filed a separate return. You'd also qualify if you were a member of the Reserve of the Air Force, Army, Coast Guard, Marine Corps, Navy, Army National Guard, Air National Guard, or Public Health Service Reserve Corps. You could deduct expenses for traveling more than 100 miles from your main home. Your deductible expenses were limited to the federal per diem rates for the city you were traveling to. Unfortunately, these deductions were eliminated along with performing artist expenses. Your job-related expenses were deductible if you were a government official who was compensated entirely or partly on a fee basis. You can claim your job-related expenses tax deduction on Form 2106 or Form 2106-EZ for tax years 2017 or earlier. Normally, these expenses would be transferred to Schedule A as itemized deductions, but they can be transferred directly to line 24 of the 2017 Form 1040 if you qualify. "If you do not meet all of the above requirements, you must deduct your expenses as a miscellaneous itemized deduction subject to the 2% limit," according to IRS Publication 529. The tax deduction for certain job-related expenses is found in Internal Revenue Code Section 62. Qualified Performing Artist: IRC 62(b). National Guard or Reservist: IRC 62(a)(2)(E). Fee-Based Government Officials: IRC 62(a)(2)(C). It's not too late to go back and amend your 2017 tax return if you missed claiming this deduction but you could have. 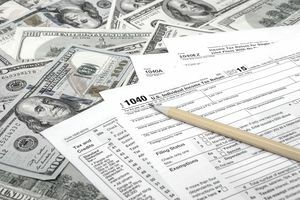 The IRS says you can amend a return for up to three years after you filed your original return, or up to two years after you paid any tax due on that return, whichever is later. Assuming you filed your 2017 tax return in April 2018, you would have at least until April 2021 to go back and amend it using Form 1040X. You would have until April 2020 to amend a 2016 return filed in 2017. Speak with a tax professional if you're not sure whether you're an independent contractor or an employee, because it can admittedly be difficult to make the distinction in this profession. There's a chance that you're an employee—even if you think you're not—if you accept work through the Screen Actors Guild, Actor's Equity, or the American Federation of Television and Radio Artists.